England first innings 398 (Andrew Strauss 122, Ian Bell 61, Shannon Gabriel 3-60) and 193-5 (Alastair Cook 79, Ian Bell 63*, Kemar Roach 3-60) beat West Indies first innings 243 (Shivnarine Chanderpaul 87*, Adrian Barath 42, Stuart Broad 7-72) and 345 (Shivnarine Chanderpaul 91, Marlon Samuels 86, Stuart Broad 4-93) by five wickets. Stuart Broad grabbed 11 wickets, followed by a 132 runs partnership between Alastair Cook and Ian bell led England to an easy win by 5 wickets vs. West Indies. West Indies were bowled out for 243 runs in their first innings, England replied with 398 and got a substantial lead of 155 runs. The Caribbeans came out with a positive batting approach in the second innings, well led by Shivnarine Chanderpaul and Marlon Samuels and smashed 345 runs. They secured an overall lead of 190 runs and England was in trouble by losing two quick wickets for just 10 runs in four overs at the end of the fourth day’s play. 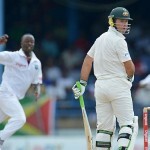 Kemar Roach picked up both wickets which included the centurion in the first innings, Andrew Strauss and the night watchman, James Anderson. 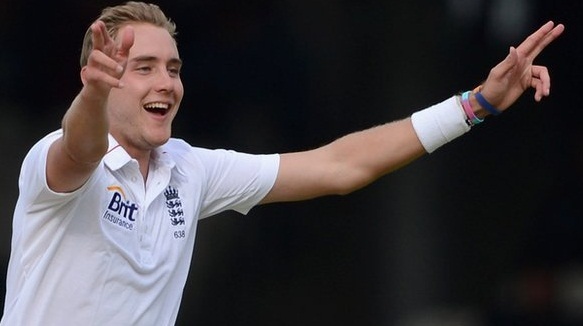 Stuart Broad (England) was declared ‘Player of the match’ for his lethal bowling as he grabbed 11 wickets in the match. The first match of the three Test series came to an end on the fifth day of the match on Monday, May 21, 2012 at the famous Lord’s, London. Earlier Engalnd started day five for 10 runs as Alastair Cook and Jonathan Trott were at the crease without opening their accounts. England started off well and Trott got three fours before he was caught smartly by the skipper, Darren Sammy in the slip off Kemar Roach for 13 and the third wicket was lost at 29 runs. Kevin Pietersen came in next and joined with Cook who had scored just one run from 28 balls. The latter opened up in the 12th over by hitting a couple of fours and the first fifty of the innings was scored in the 13th over. 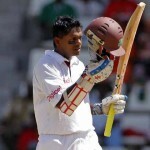 Darren Sammy introduced Shannon Gabriel in the 14th over and he produced an important breakthrough when Pietersen was caught behind by the wicketkeeper, Denesh Ramdin for 13. The fourth wicket fell at 57 and the home team still required 134 to win the match when Ian Bell joined in with Alastair Cook who was securing his end while adding useful runs. The duo started playing sensitive cricket without taking any risk and negotiated the rival bowling on merit. Cook changed his tactics and dispatched the loose balls out of the boundary on numerous occasions as Bell kept on cruising from the other end and the first hundred of the innings was posted on board in the 25th over. Cook achieved his fifty on the third ball of the 31st over with a four and the score was enhanced to 131 for the loss of four wickets in 32 overs when lunch was taken. Both batsmen kept on accumulating the runs after lunch without any difficulty and 150 runs mark was crossed in the 39th over. Ian Bell smashed his fifty on the third ball of the 41st over with a couple and they added 132 runs for the fifth wicket when Cook was gone for 79. 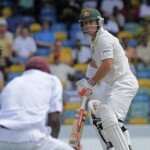 England achieved the target by thrashing 193 runs on the first ball of the 47th over as Bell remained unbeaten for 63. Kemar Roach was the most successful bowler with three wickets whereas Shannon Gabriel and Darren Sammy claimed one wicket each. England leads the three Test series 1-0 and the second match will be played from May 25, 2012 at Trent Bridge, Nottingham.